The drive does exactly what it claims to do: simple, painless upgradeability all backed by a reasonable MSRP. 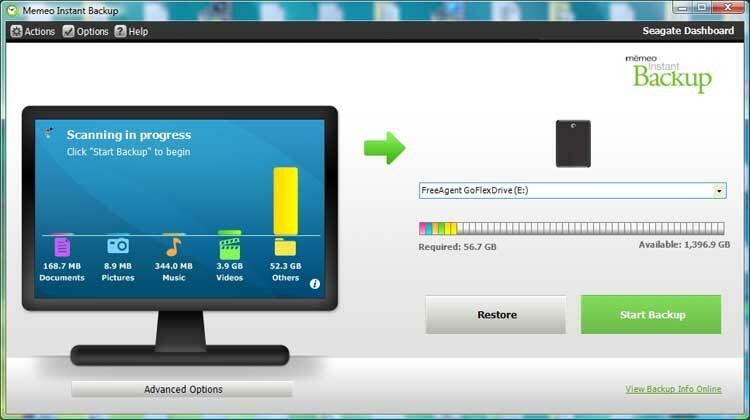 With minimum effort, you can customize any size drive's interface to suit your changing needs. 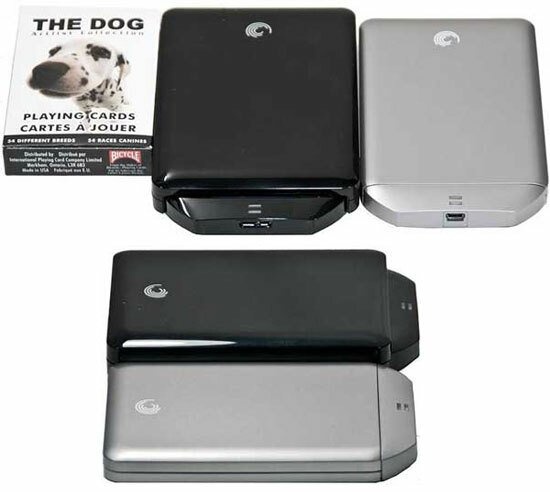 The GoFlex Portable line consists of two very similar yet distinct form factors (three if you count the Slim model). The smaller form factor is reserved for the lower capacities (320GB, 500GB and now 750GB) iterations with all larger capacities (1TB and 1.5TB) opting for the larger form factor. Neither form factor is what you could considered large, but the 500GB’s slightly shorter (0.57″ vs. 0.87″) narrower (3.19″ vs. 3.51″) and shallower (4.39″ vs. 4.71″) dimensions do make it slightly easier to transport when compared against the 1.5TB model. Both form factors are made from the same plastic, but the smaller capacity version come in a variety of colors; whereas the larger is only available in black at this time. Neither model is exceptionally small and neither is exceptionally large; so while there is a bit of a size difference it is not enough to justify going with a smaller capacity drive. The main reason for opting for the 500GB is not its smaller stature, but its extremely reasonable price of only about $70. If ease of transportation is your number one priority you are much better off opting for the GoFlex Slim as it is much, much smaller than even the 500GB version. Should color be your main concern and you do not want a black drive, you will indeed be best served with the smaller capacity drives. 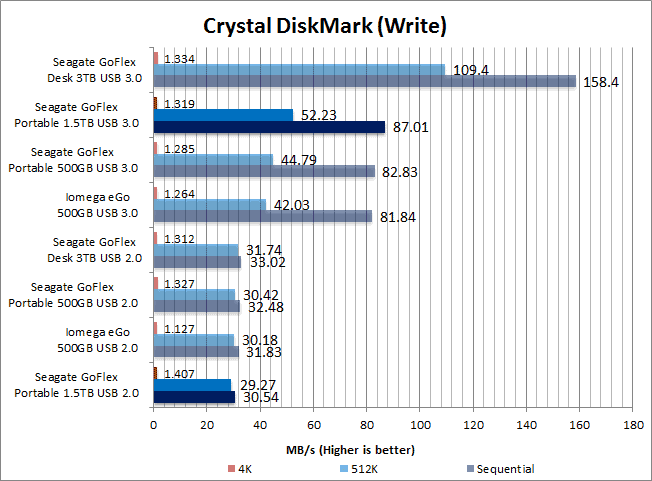 When you compare the size of the Seagate GoFlex line of drives to that of the LaCie’s Rikiki or WD My Passport SE, the GoFlex line falls firmly in the middle. Seagate got the delicate act of balancing portability with capacity better than some, but not as good as others. They are neither the smallest, nor the largest of external storage devices in this niche I have looked at; rather, the trade-offs Seagate made will make them appeal to a very broad audience of consumers. Many people should consider them to be not large, nor small but like Goldilocks, consider them just right. Other than boasting the densest external (2.5″ hard drive based) storage solution on the market today, the GoFlex Portable’s main claim to fame is its modular abilities. Unlike any other storage device I know about, with a simple – yet firm – tug, you can remove the GoFlex Cable from the device and swap in a new cable. On the surface of things, this does not sound all that unique; however, what Seagate calls a “GoFlex Cable” consists not only of a data cable, but the actual controller chip as well as a standard SATA connector port. The SATA port on the back of the cable literally plugs into the GoFlex’s internal hard drive. This means that not only can you buy one device to cover all potential situations, it is also about as future-proof as you can get. If a new standard comes out that you need compatibility with, one inexpensive (compared to an entire new storage device) purchase you can easily upgrade your “old” model. As an aded bonus, all cables are interchangeable between models. If you have an older 500GB with a Firewire GoFlex cable and purchase a newer 1.5TB (for example) with USB 3.0, there is no need to buy a second cable for each. 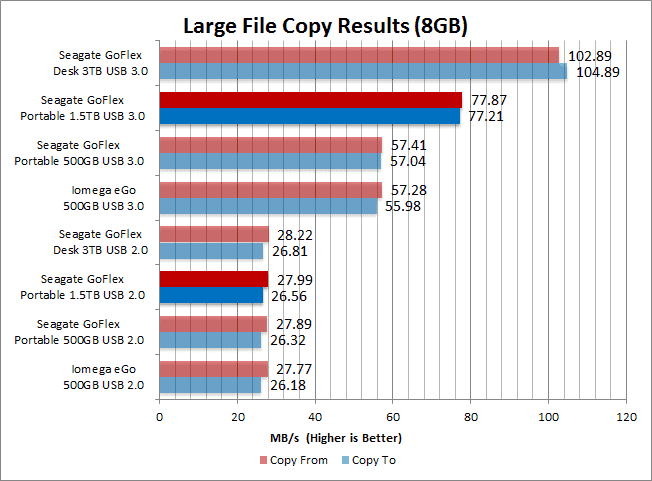 USB 3.0 now comes standard on all GoFlex’s. The adapter contains both the external interface and its bridge controller chip. This certainly will cut down on you e-waste and give you a level of flexibility unheard of in this niche. As of now, you can purchase a FireWire 800, USB 3.0, Powered eSATA or ancient USB 2.0 cable. The standard cable for all GoFlex’s is now USB 3.0, so the need for a dedicated USB 2.0 cable is now pretty much moot. However, I can see the potential uses for a FireWire cable, as this with a standard USB 3.0 cable would cover off nearly all systems out there. When it comes to the software, Seagate’s bundled all the variously sized iterations with the same software: the Seagate Dashboard software suite. The first time you attach the drive to a system, you will be greeted by a pop-up window prompting you to install the included Seagate Dashboard software. 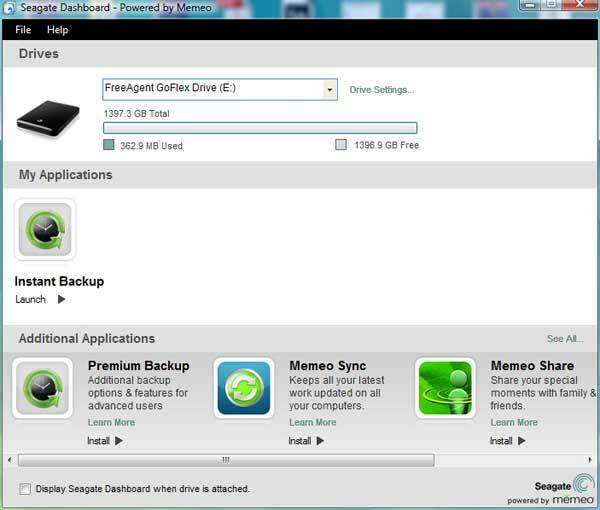 The Seagate Dashboard consists of numerous different programs, though all but the Memeo Instant Backup are trial-ware versions. The Memeo Instant Backup is a fairly basic, yet reasonably proficient software solution. Its only job is to backup and restore data and it does this with very little hassle. You can tell it what to backup and you can even tell it to encrypt the data using AES encryption (the encryption is software based only and not hardware based like some others in this niche). All in all, it’s an adequate solution without being overly complex, overly cumbersome or even have much of a learning curve; just do not expect it to be as polished as some other software solutions. The 1TB and 1.5TB versions also came with a very nice bonus software in the form of a free movie. In fact, these drives come preloaded with 21 movies. Sadly, you only get the key for the Star Trek 2010 re-make when you register your drive. To unlock the other twenty movies, you need to pay for them as they are all in DRM’ed .WMV format. 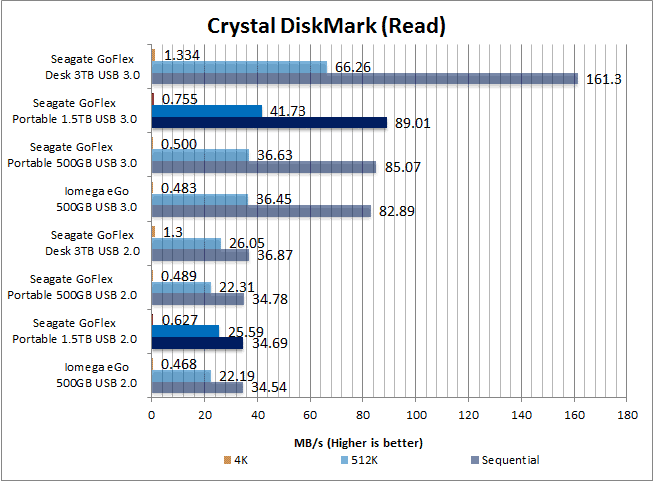 As you can see, the GoFlex drives post very good sequential, mid and small file performance numbers. The largest limiting factor is of course their reliance on a 5400-rpm hard drive, but when compared against drives in the same niche, all are above average. As stated earlier the fastest version is of course, the 320GB Slim model, but after it the 1.5TB Portable is one fast (and large) device. This is to be expected as the 1.5TB is the flagship model and as such comes with a price premium. If your needs are more pedestrian (both capacity and speed) then the 500GB will impress as it too is fast for its niche. Much like the synthetic test results, the GoFlex line of drives are powerful and fast devices. The small file performance may not be a lot to write home about, but compared to other similarly priced 5400-rpm drives, their balance of capacity, price and performance is very potent. With that being said, the 1.5TB model is much faster than the 500GB iteration. This is because of the ultra dense platters that model boasts. 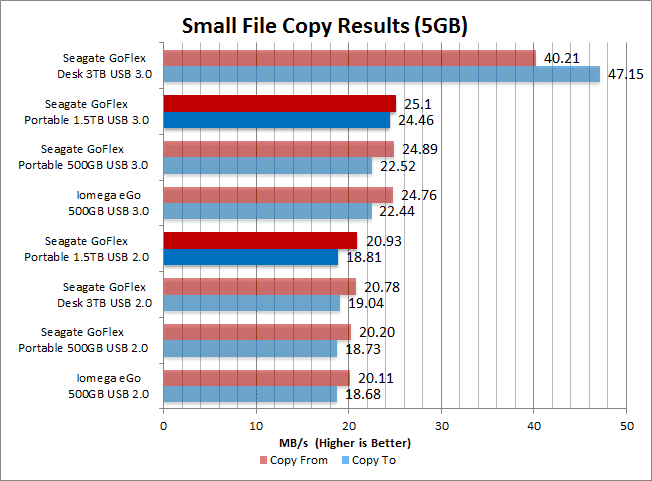 However, for a 500GB device, the GoFlex Portable is actually above average in the speed department. If all you need is 500GB, you should have slightly lower expectations. If I had to rely on a “sneakernet” to move a lot of information from point A to point B, a 1.5TB drive would be the one I would reach for. It all depends on your requirements and your budget, but in either case you really can not make a bad choice opting for a Seagate GoFlex. With the GoFlex Portable line of drives, Seagate really has managed what was unthinkable not that long ago: truly customizable external storage. Within a matter of seconds, and for a minor to moderate investment, you can swap out one GoFlex cable for another and be enjoying what is for all intents and purposes, a new external drive. With the exception of relying on a 5400-rpm drive, this is a setup which works and well. No matter what your needs or requirements are – be they massive storage needs, flashy good looks, performance or even small foot print and ease of portability – one (or more), GoFlex Portable drive will fit the bill perfectly. If you require massive storage abilities, coupled with above average performance, but do not want to opt for a larger desktop model, the 1.5TB would be an excellent choice. If your budget and storage needs are more frugal the smaller 500GB model would also be a wise investment.